I figure that it might be time to make a thread on this. I'm sure I'll have a few questions as I go along and I want to keep this all in one place. AND, as a bonus, I get to show off my projects! 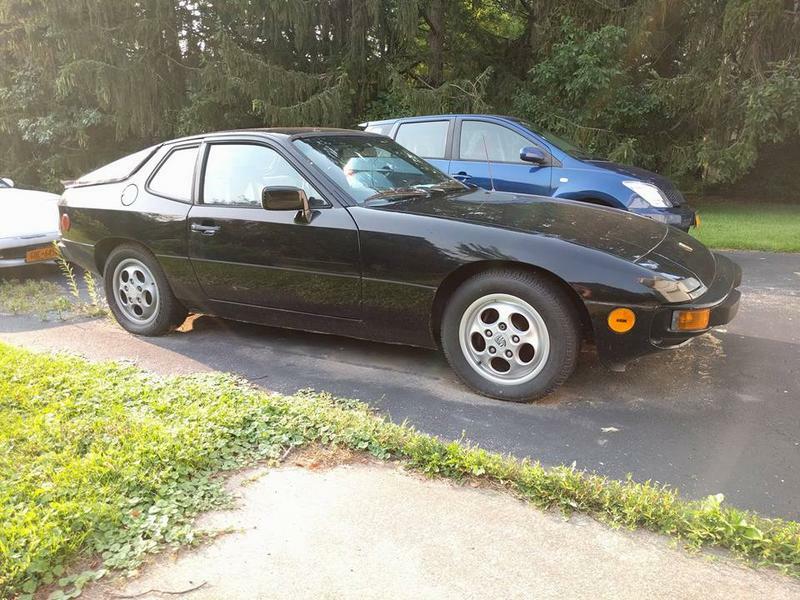 After buying my 1980 924 this spring, I've had people coming out of the woodwork with 924's. It seems like every other week somebody comes up to me with a comment like "Hey, I have one of those in my barn, but it doesn't run." or "My buddy has one of those. We never could figure out why *insert problem here* doesn't work". With comments like that, it was only a matter of time before I started asking "How much?" I needed another project like... Well, I needed another project like the 27 (!!) motorcycles I've been hoarding in my garage. Needless to say I didn't need one. 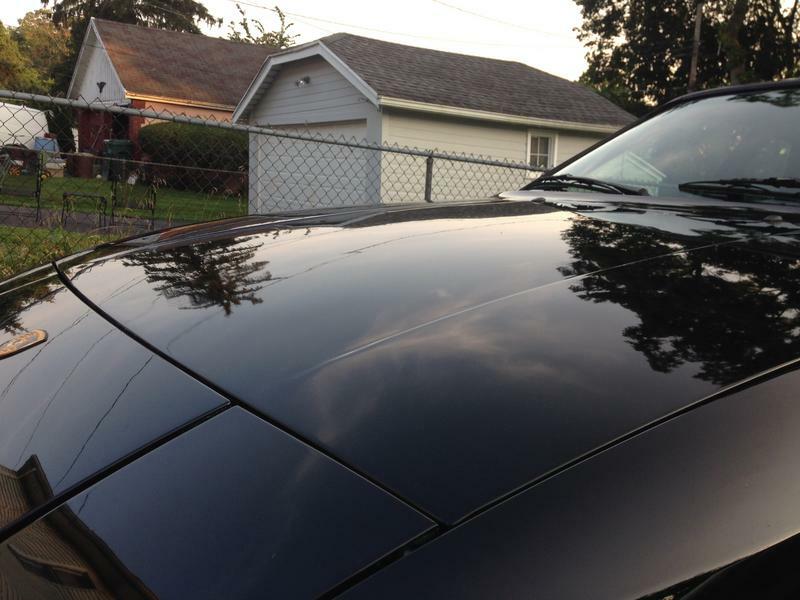 - The passenger side door and rear quarter panel had peeling paint/body filler from a previous accident. It looked fixable but still an annoyance. After looking over the car, I found out that the owner was looking for a staggering $2500 for it. In my neck of the woods that'll buy you a decent running car with a worn interior. Not a beautiful car mind you, but one I could at least drive home. I thanked the owner for his time but explained that it was more than I was willing to pay for a non-running car with an interior that probably needed to be gutted and replaced. As I was walking away, he asked "Just out of curiosity, how much IS it worth to you?" I explained that I probably wouldn't be willing to pay more than $500 for it in its current condition and that he would probably be better off parting it out than selling it to me to restore. When he heard the word "restore", his eyes lit up. 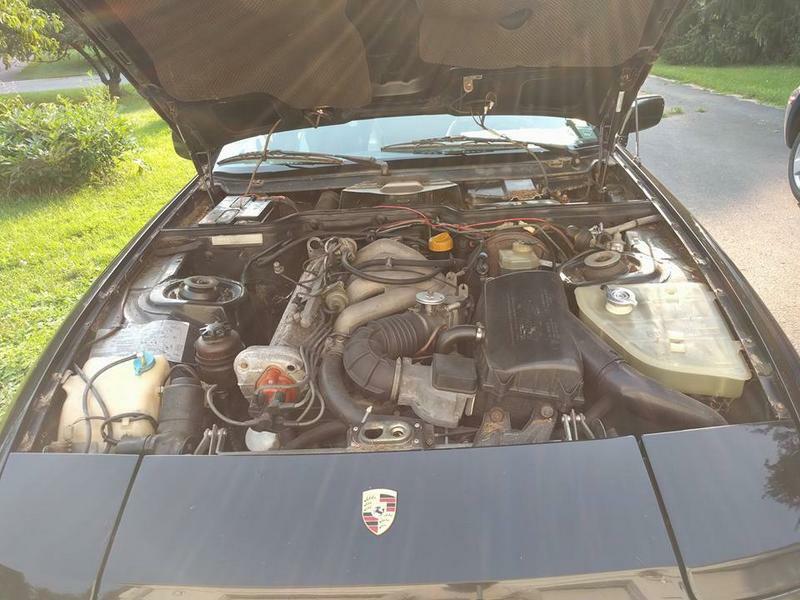 He apparently was willing to sell it for a lot less than his asking price if it wasn't destined to have its expensive parts ripped out and then be sent off to a scrap yard. After a little more talking, we agreed on $500 and I went off to find an ATM and to grab a trailer. There you go, saving another one from the crusher! Hundreds of posts here on restoring these beauties. Take a look at the garage manual on clarks-garage dot com for individual instructions for each subsystem. Work your way from mechanical to interior. Heck who needs nice seats? My first purchase for this car was a Haynes manual and I've been lurking on Clark's garage for about a month. I don't know who Clark is, but I feel that I may owe him a few drinks by now. My second purchase for the S was a timing belt, balance shaft belt, and water pump. My intent is to check the rollers and replace if I feel it's necessary. The rollers were just done 1500 miles ago, so assuming everything spins freely, I'll just subtract that 1500 miles off my next service interval. I understand that looks should come second, but I have some very lenient neighbors. I don't like making eye sores for them, so I washed the car, clay barred all the paint (and windows), and attacked it with a buffing pad after work for 3 days in a row. I think I did ok, but I'll let you be the judge. There are still some blemishes I couldn't buff out, but this was a huge improvement. Next came the interior. The first thing I did was remove the seats. Under them, I found the usual loose change and receipts. I also found a vintage 1987 pop tart still in the (now disintegrated) wrapper, a tin of altoids in roughly the same shape, and what was left of a piece of coat hanger that had rusted into the floor. I pulled out the carpet and found a bunch of gross rusty looking gunk. I think it was once soundproofing. Not anymore. Unfortunately my hands were really dirty so I didn't get a picture of how bad it looked. The soundproofing was all flaking up anyway so I took a putty knife to it and cleaned it up with degreaser. It actually cleaned up well. 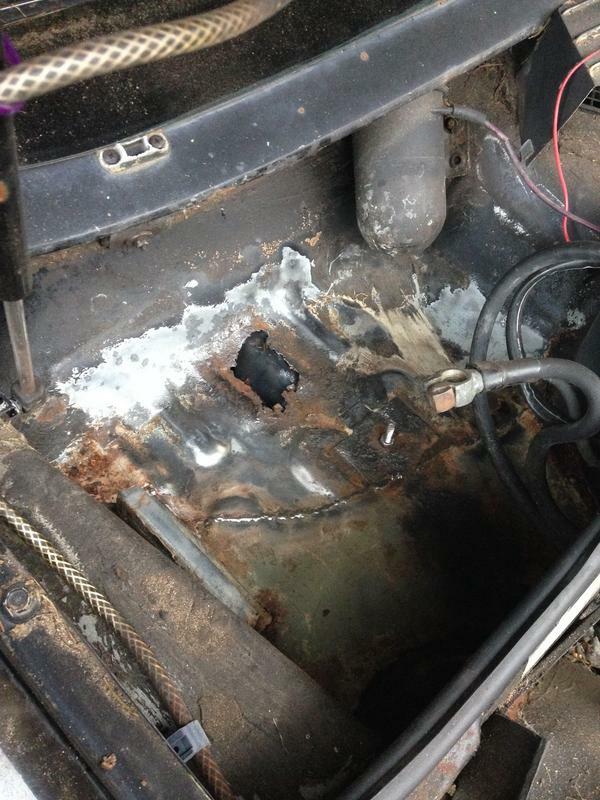 Amazingly, it seems like the floor pan was still solid! 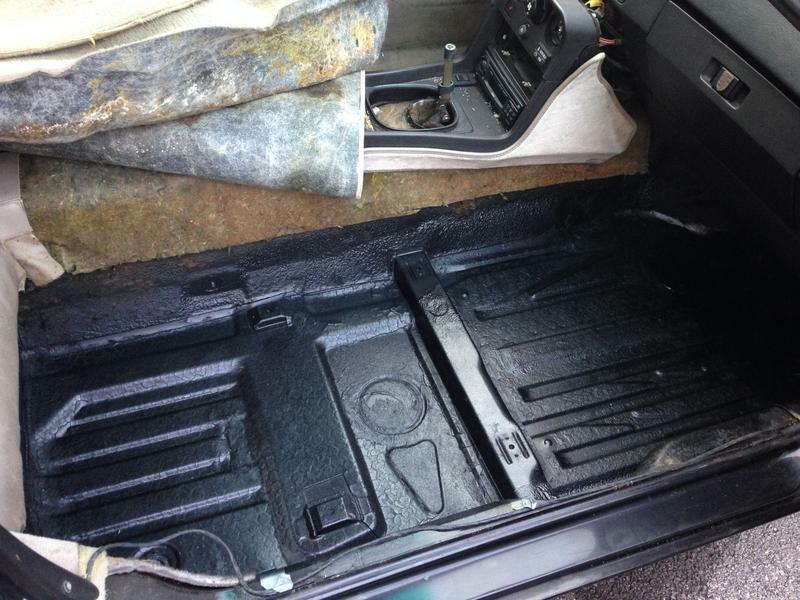 I sprayed it all down with rust converter to neutralize any surface rust and then coated it with bed liner. Then new Jute padding. The stock stuff was a soggy stinky mess. Poor quality photo due to me running out of daylight. After scraping off all the chunks, the carpet got a treatment of degreaser and a power washer, then carpet cleaner, and another power washing. I vacuumed them and hung them up to dry. All of the moss, and most of the discoloration came out. Not perfect, but loads better. It should tide me over until I can find new carpet. The trunk however is another story. The carpet was so bad that I just left it out. There wasn't any pile left, so I just hung it up in my garage. I'm currently looking for new carpet, preferably black if anyone has a lead on anything. For the mechanical aspect, I was told that the car had started and idled about 2 years ago. The catch? It would only run on starting fluid. Since I had run into some fairly annoying issues with my other 924 due to corrosion on grounds and fuse blocks, I disassembled and cleaned all the grounds and terminals in the fuse block. 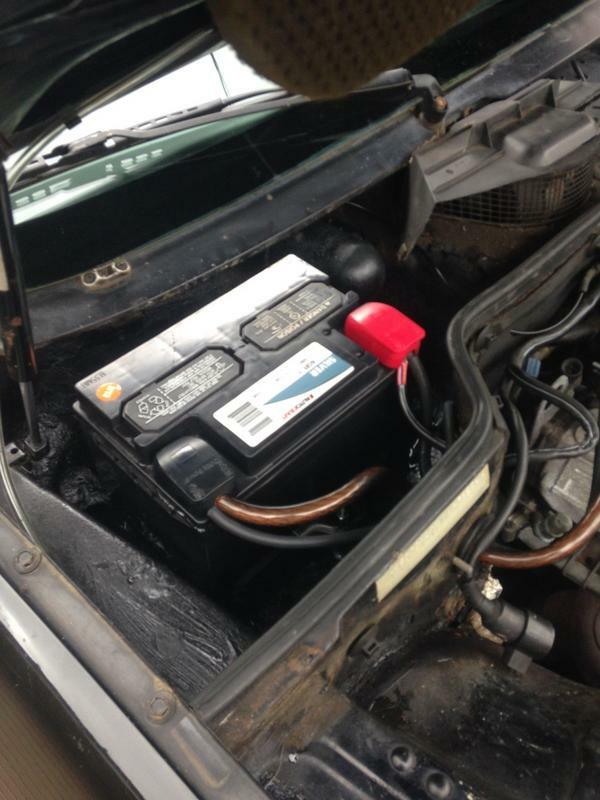 In the process, I found a burned out fuel pump fuse (no fuel? I wonder why??). I replaced the fuse. While I was in there, I also found wiring spliced into the ignition switch for what appeared to be an aftermarket immobilizer. Curiously, there was a switch and a relay, but no box plugged into the harness. I removed the wire nuts, ripped all the non-factory wiring out, and soldered/heat shrunk all of the factory wires back together. While I was on the kick of working on the electronics, I took the 7 year old battery out. I know I'll probably need a new one, but I threw the old one on the charger just for kicks. After looking under the hood, it was apparent that my J boot and a couple of the small vacuum lines had seen better days. I replaced the J boot as well as all of the damaged vacuum lines I could find. In the meantime, I received my timing belt tools and my belts... as well as the wrong water pump . I've been working in my garage/driveway with no power and no lights. I rent shop space about 2 miles away and it would be really handy to have a place I can change the belts with some light and power. That made up my mind to see if she would fire up. I changed the oil and spark plugs. I drained out the 7 year old gas and put in 5 gallons of 91 octane with no ethanol, plus a bottle of techron for good measure. Apparently the battery took a charge... first crank: nothing. Second crank: nothing. Third crank: you guessed it... KABOOM!!! Just kidding. It fired up on the third crank and idled a little rough while burning off the old gas. I was a bit shocked that it actually started let alone idled. I do have a whining noise (balance shaft belt?) and a ticking noise (injectors?) at idle. The ticking goes away as the engine is revved. Now I just have to make sure the lights, horn, and brakes work so I can register it and drive it to my shop to do the timing belt as soon as the correct water pump arrives. Hopefully at that point I can pinpoint exactly where the noises are coming from and fix them. 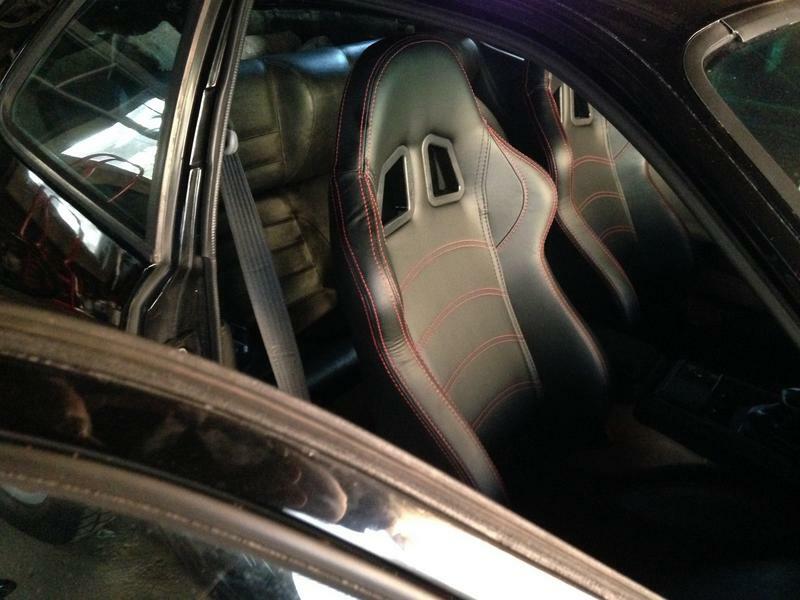 In the meantime, I ordered a new set of aftermarket "racing" seats. The ones I ordered are ebay specials, but they have really good reviews. 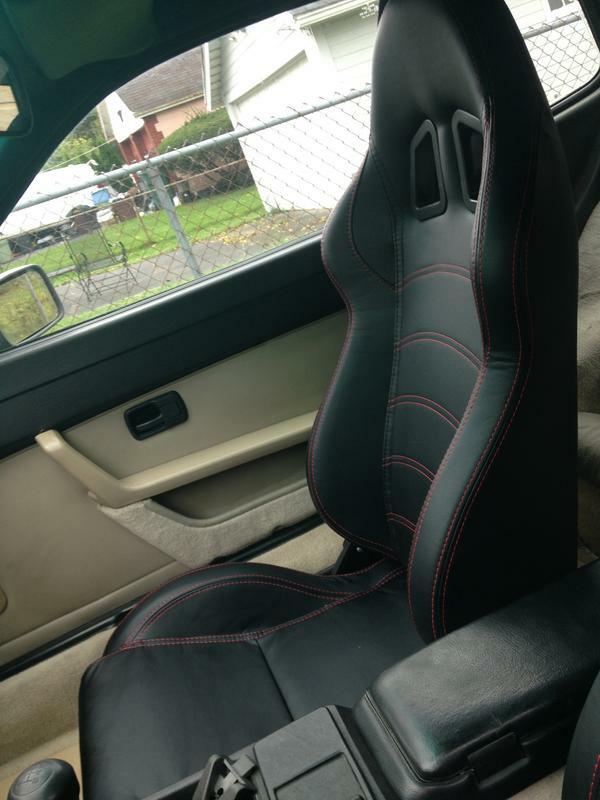 I won't be racing with them and they're only temporary until I can find a set of factory seats that don't give me hives every time I sit on them. I'm getting really excited to see this come together! So, no pictures today. My lady friend has been sick so I've been taking care of her until after dark then working late at night. A few little things came together - and apart last night. When I bought the car, the sunroof wind deflector was in the trunk with broken hinges. I received the new hinges yesterday and assumed it would be a small but rewarding item to fix. I installed the new hinges and went to pop the middle hinge on. With a nice loud *CRUNCH! * the center hinge snapped in half. I decided to pull it off to see if it had a part number on it and managed to break the little clips that hold the micro-switch button on too. Since all of the other parts on this sunroof have been upwards of $25 each, it's needless to say that I was really frustrated. BUT, low and behold, Sunset stocks the piece I needed for $3.25. Cheaper than a hamburger at my local fast food joint. Unfortunately shipping was $7, but at a little over $10, I feel that I got off pretty easy. If only the rear lift arm covers were that cheap. I'm still choking on having to spend $108 on two simple injection molded parts. Since it was dark out, I also had a chance to asses and troubleshoot my lighting situation. It appears that my headlights, tail lights, and brake lights all work as intended. The turn signals come on but don't flash. I assume this is a problem with the relay. I tried cleaning the relay contacts, but didn't have much luck. Since the relay was cheap, I ordered a new one. I also had a chance to clean the door switch contacts for driver's door. Now my dome light comes on when I open the door! It's amazing what little things like a dome light will do towards the feeling of having a fully functioning vehicle. I was able to get a few things accomplished this weekend. 1.) Remove all of previous owner's attempts at sealing the battery tray. 2.) Cut out the areas that were rotten. 3.) Grind off tack welds on the battery mount. 5.) Coat with rust converter. 6.) Lay strips of chopped mat and over any holes and cracks. 7.) Coat with epoxy resin. 8.) Lay 3 more layers of chopped mat and epoxy resin over entire tray. 9.) Take picture for the forums. So far, I have a completely waterproof tray. Step 10-12 will happen this week. I'll update with pictures when I finish it. I also had a chance to install some new seats. I think they came out really nicely. 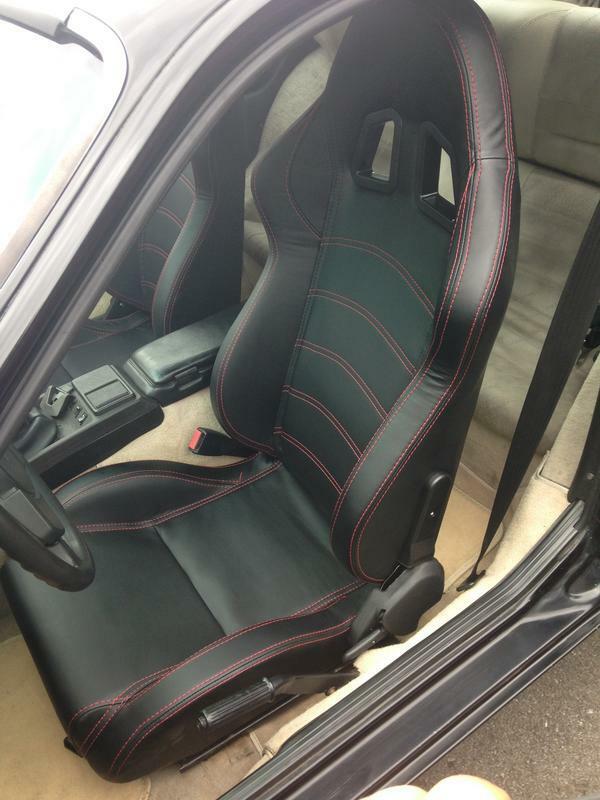 The bolt pattern on the seats was surprisingly similar to the stock seat pattern. I actually was able to reuse the stock sliders. I only had to drill 2 holes in each the stock rails to mount them up. 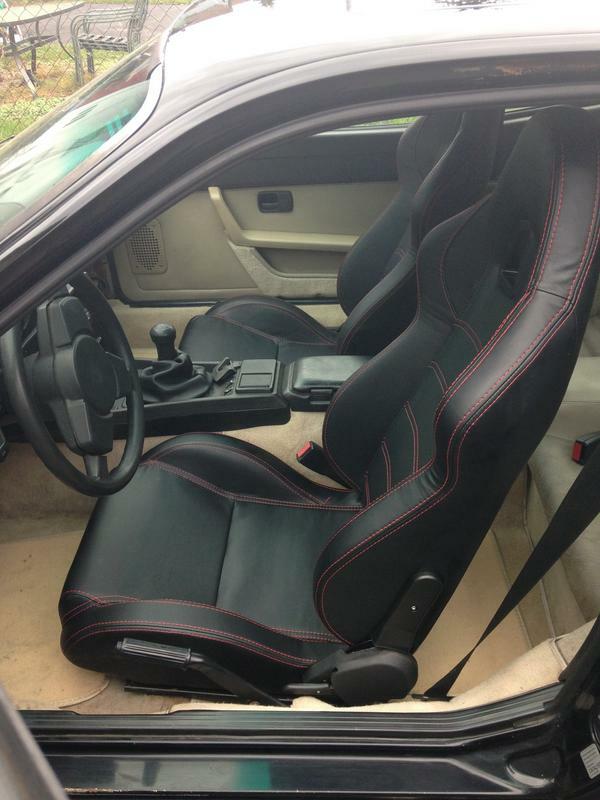 I'll be holding onto the stock seats in case anyone ever wants to put it back to stock. I forgot to take pictures of the original seats, but they were pretty bad. These ones make the interior feel and smell like new. Congrats on doing a fine job to bring another Toofah back from the grave. Thanks for the kind words regarding the seats. I'm very happy with them. I may need to buy another project car so I can buy another set. They're that nice. I have a few small updates I thought I might share. 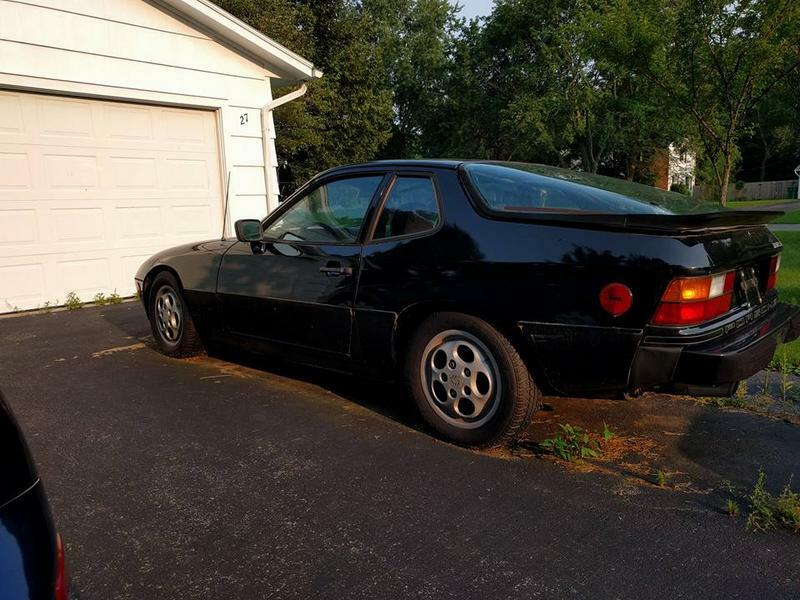 I found a 944 being parted out about an hour away from me and decided I would go and buy anything that may be useful for my car. 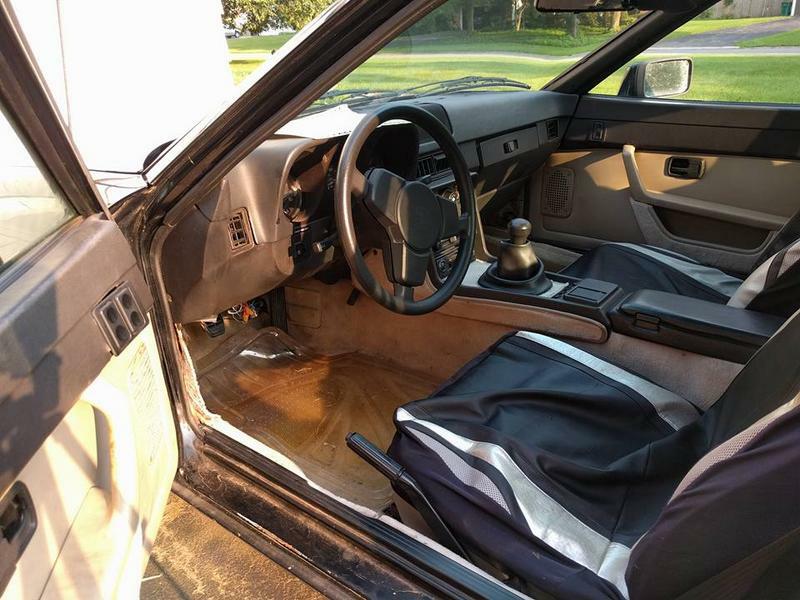 I ended up with a sunroof, a black leather rear seat, a black set of carpet - minus the trunk piece , a spare DME, a spare shifter lever that needs a new pin, and a rear hatch (also delaminated unfortunately). 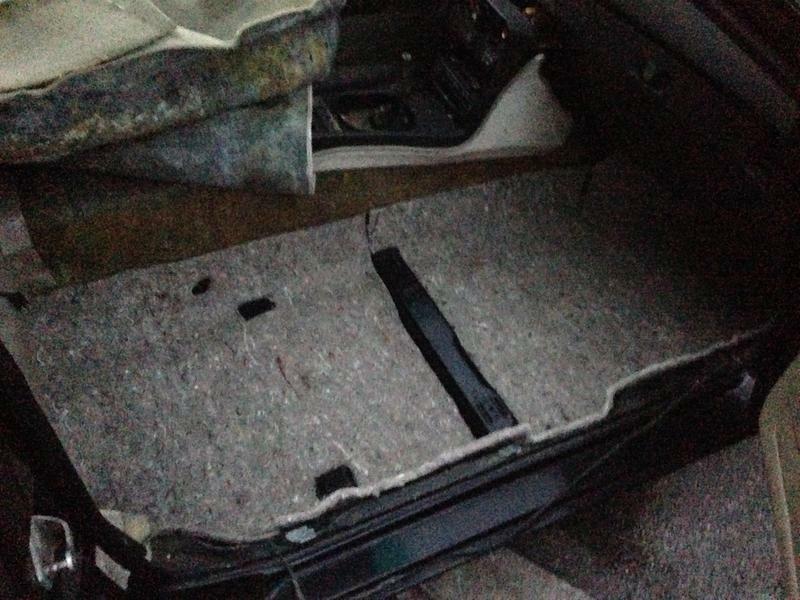 The owner said he would save the carpet for me then sold the hatch piece... which was really the only piece I needed. Anyway, I did get a good deal on what parts I did buy. My girlfriend also gave me a hand pulling everything apart. I think she's getting a little more interested. Overall, I was happy. 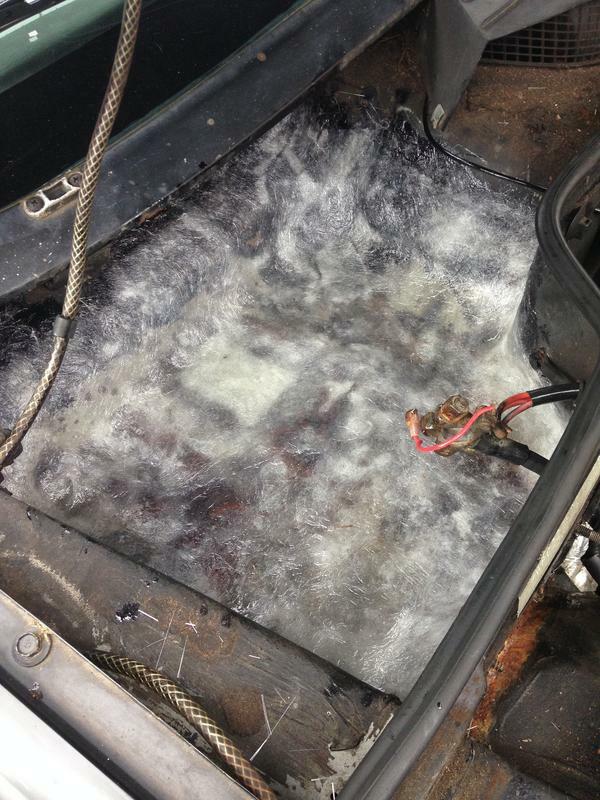 After getting home, I replaced the panel in the inside of the sunroof, the rear sunroof latches and the sunroof seal. The seal was only slightly better, but should last me until I decide that it has become a priority. I still have a long way to go and need to be a bit frugal until I get the FOES done. I also got a chance to replace the old ratty looking tan script seat with the nice leather one. The leather matches the front seats much better. 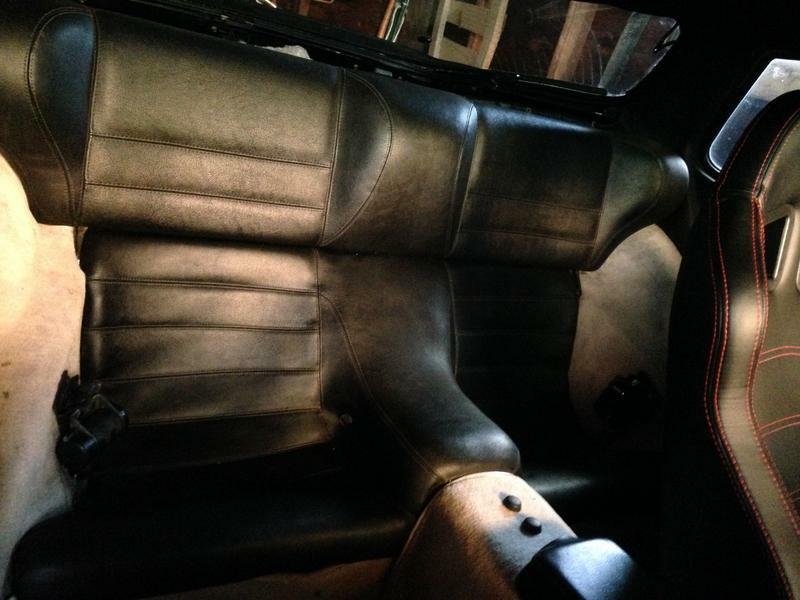 It isn't a perfect match, but the front seats should shine up a bit with age and conditioning. I also stumbled across a little luck and found a Thule fit kit for a 924. I bought it, although I don't have a rack to go with it yet. That will be in the future for the S. Maybe the possibility of kayaking will make my better half more interested. That remains to be seen. On top of all the progress I made, I also had a bit of a setback. While backing the car into the garage, the fuel pump gave up. After looking over everything, I found a blown fuel pump fuse. I replaced the fuse and attempted to start the car. The new fuse immediately blew. I replaced the fuel filter. The fittings were rusted solid and took a little creative thinking to remove. The fuse still blew. I unhooked the pump and plugged it directly to a battery with a 15A in line fuse. A short whirring noise... then POP! Blown fuse. I searched around a while and found a TI Automotive pump. Apparently TI Automotive bought out Walbro... or at least I read online. I'm not so sure that's true. The GCL606 kit was about $84, so I just bit the bullet and bought a new one. The TI Automotive looks exactly the same as the Walbro pump other than the TI Automotive logo in place of the walbro logo. It even came in a walbro branded box with genuine walbro fittings. Based on this, it seems like the real deal. After installation, it fired right up. I did note that the walbro pump is MUCH quieter than the Bosch one on my 924 and the old one on the S. I guess only time will tell how it holds up. This car just keeps getting nicer and nicer. I'm looking for a little information on two different topics. 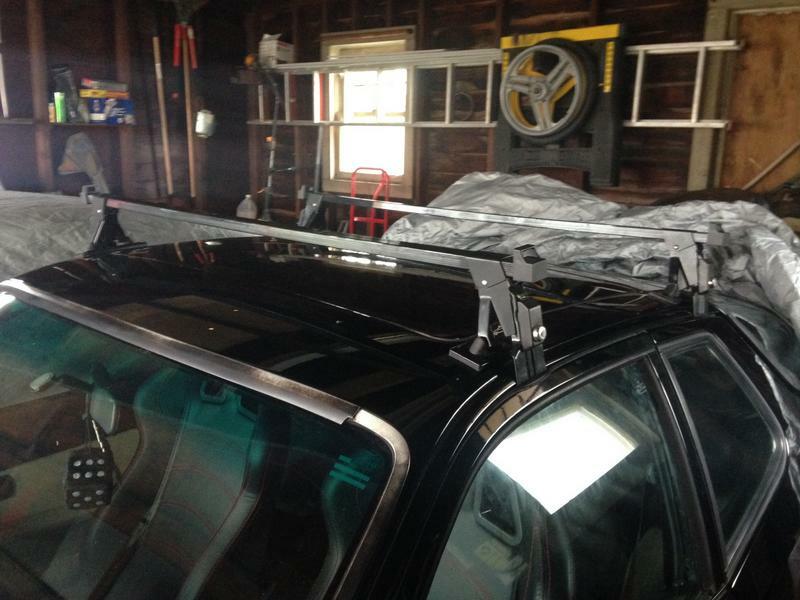 I bought a Thule fit kit and locking feet for a roof rack. I'm looking at load bars, and found some knock-off racks for sale. I'm wondering if the load bars from a cheap knock-off rack would fit on genuine Thule feet. 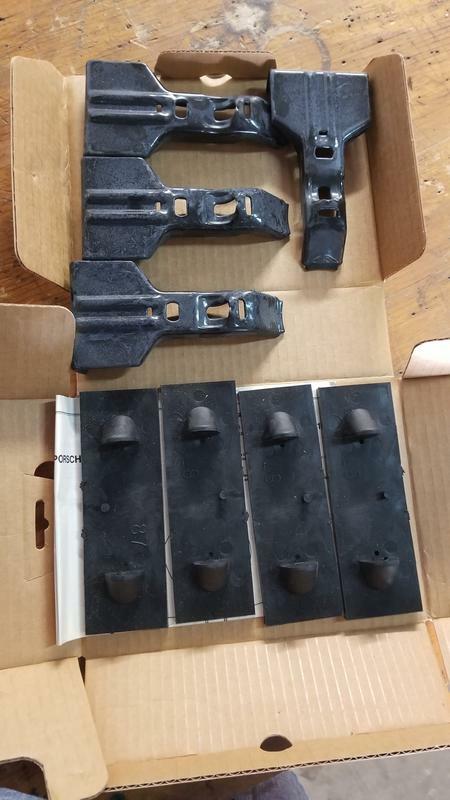 I can buy a whole knock-off rack brand new for $20 or used name brand load bars for $50+. Can someone with a Thule rack provide the outside dimensions of "square" Thule load bars? I'm also in need of a new muffler for the 924S. 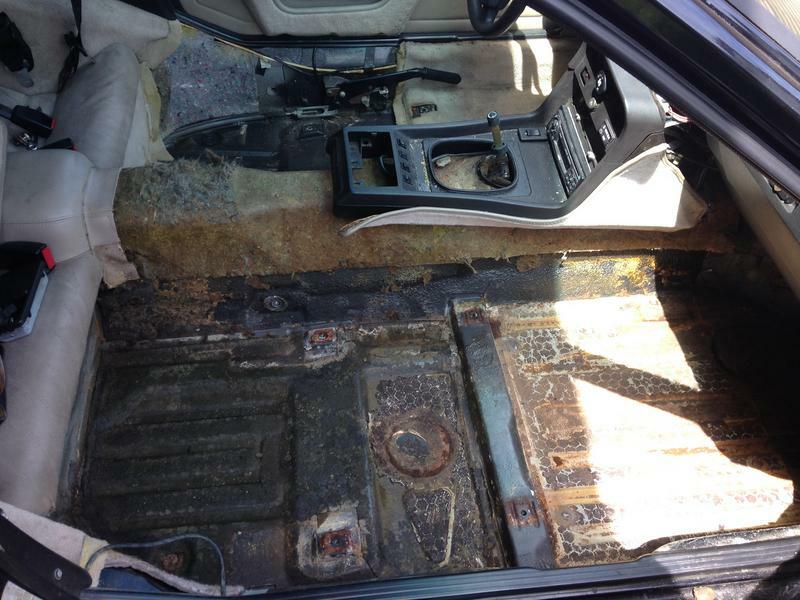 Mine is rotted on the bottom and leaks rusty condensation when I start the car. I'd love to install a whole stainless cat back exhaust, but I'm concerned with the noise level. There are a few on ebay: OBX, Becker, Dansk, etc. I guess I could just replace the muffler instead as the pipe doesn't look horrible. Is there a stainless muffler that provides similar flow and noise levels to the stock muffler? I see people talking about Megnaflow, Flowmaster, Borla, etc. I can watch videos of exhausts until I'm blue in the face, but I don't know what other mods people have done or the exact models of the parts they're using. And besides, the camera never picks up the sound well anyway. I want something stock or slightly louder sounding with no raspy honda civic noise. Is there a stainless cat-back for sub $400 that would provide what I'm looking for? If not, which muffler should I be looking at? I intend to keep the stock headers and cat as I understand there's not much gain to be had in either other than more noise. 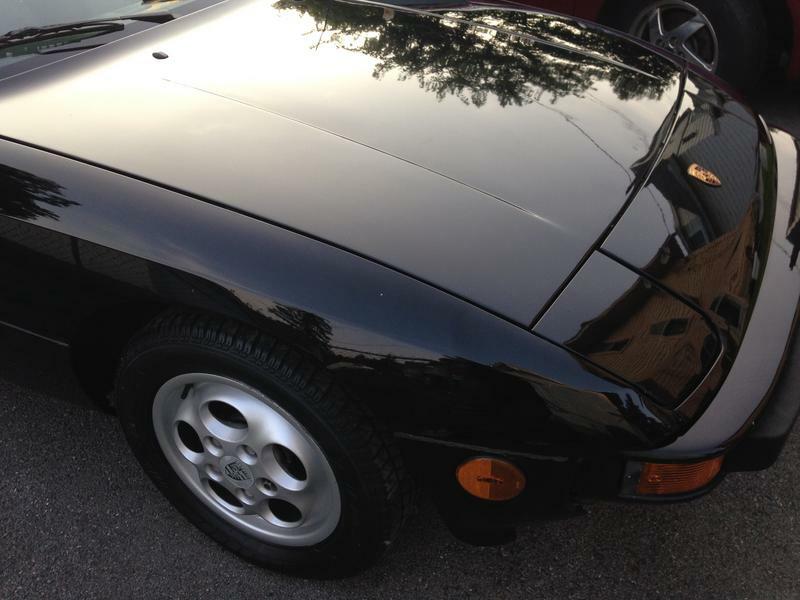 On a side note, the exhaust on my '80 924 is stainless. Was it ever a factory option to have a stainless exhaust? There aren't any markings that would lead me to believe it's an aftermarket add on, and it isn't any louder than I would think a factory exhaust should be. I'm fairly certain that the pipe on my '87 isn't stainless, but I haven't put a magnet on it either. 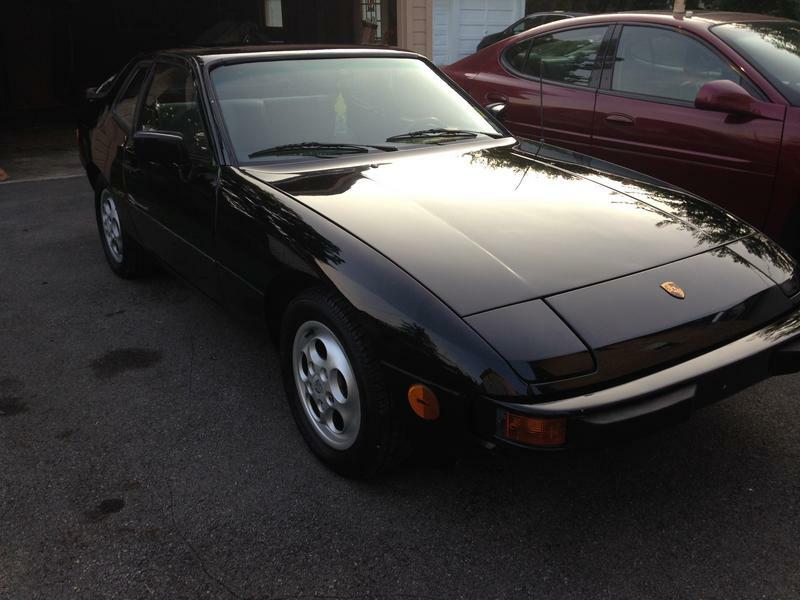 It's too bad I don't know of any other 924 owners in my area. I think I may be the only one around here with a running '24. I feel like I post a lot. I think it boils down to how much I enjoy these cars. The wrenching, the driving, the smile on my face. It's a win-win-win. Anyway, I had a couple days off for thanksgiving. I don't enjoy Black Friday shopping so I spent Black Friday changing out the timing and balance shaft belts. I was going to do the water pump too, but the last person to take off the balance shaft pulleys was large and green and angry The first one came off hard and then I broke my pin wrench trying to take the second one off. I ended up installing the belts and calling it a day. I'm probably going to order the ArnnWorx wrench and have another go at it at some point. All in all, the belts took me about 4 hours. It was much easier than I assumed it would be. Now that I've done it once, the next time should take a little less time. I used a set of cheap ebay knock-off load bars until I can find a set of real Thule ones locally. It's amazing how expensive Thule stuff can be for how simple the design is. I bought everything used except the fit kit. I have a lead on a few more NOS fit kits if anyone wants one. It should be nice being able to transport the kayaks when we go camping next summer! Where did you find some fit kits? There have been people on Pelican who have spent a year or more looking for one. If you'd like one, shoot me a PM. I found them at a local brick and shop. They were a bit expensive, but I didn't have any luck finding them anywhere else, let alone cheaper. I may buy a few and post them up for sale if anyone here is interested. It's a small shop, so they'll usually cut me a deal if I order a few items at once. It looks like my photos disappeared... all the edits are because I was fixing broken links. I worked on it a bit over the weekend. Updates to come soon. Until then, take a look at this battery box!! It's ugly but it doesn't leak. I may brush it with seam sealer and put another coat of bed liner in there but for now, I'm happy with it. Better than the asphalt shingle and roofing tar that was in there. 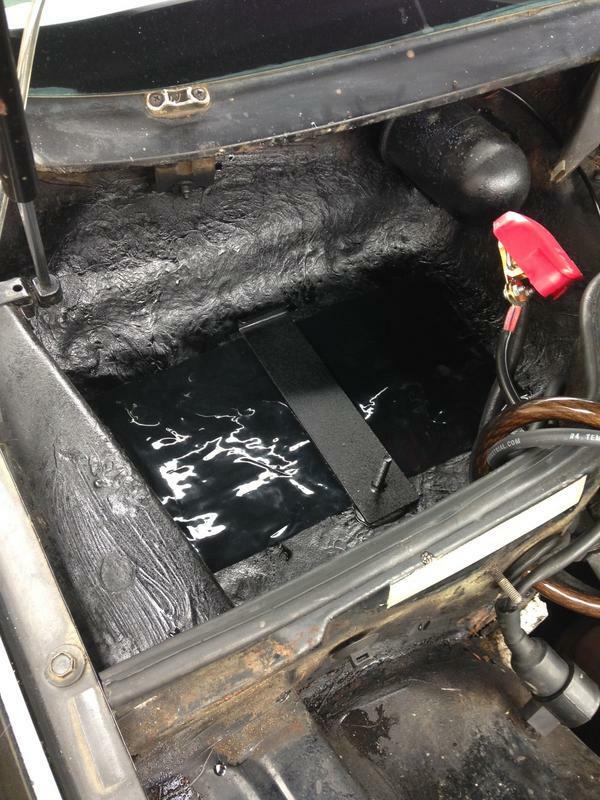 I think the battery tray may need some seam sealer on both sides of the car as the old stuff looks pretty past its prime. As far as I can tell, it isn't leaking anywhere, but it's probably a matter of time on the driver's side. At least there's no more rust. I wish I would have gotten some pictures of the headlight install with the relay harness. It was a pretty nice upgrade and my headlights are way brighter than they were before. Best of all, it draws directly off the alternator so my dash switch isn't taking all of the current that it was before. It's interesting to note that the new 60W bulbs are brighter than the 100W H4 bulbs the previous owner had installed. It's amazing what a good power source will do for lighting. The best part is that the relay harness plugs into the stock harness so it can be removed if I ever want to go back to stock for some reason. I also got an old delaminated hatch off from a 944 to reseal. All of the adhesive was removed from the glass and the frame. All told, it took almost a full day of work to pull apart and clean up. Now I just have to buy adhesive and reseal it. I'm kinda wishing I would have just bought a good hatch at this point but I'm in too deep to give up yet. I'll post pictures/results when I seal it up. I've been looking at 3m 5200 marine adhesive sealant. The boat guys say it sticks to anything including aluminum and glass, it's UV resistant, and it comes in black. Only time will tell if it's as invincible as they say. I attempted to buy a new hatch carpet on ebay. The carpet showed up after more than 2 months only to be covered in black mold, encrusted with sand, and crawling with tiny bugs (fleas?). The listing simply said "good condition". When I emailed the seller he responded with "Yea, it's moldy. It's from the 70s. What do you expect?" and refused to let me return it for a refund. I ended up battling it out with the seller through ebay. I eventually got my money back and threw out the carpet. What a nightmare. Needless to say I'm still on the search for decent hatch carpet if anyone has a lead on one sans bugs. I should have it on the road early next month. I'm pretty stoked.